I came across a quote from John Lennon today that I think perfectly encapsulates the Summer of Tim. While some of you reading may often question the use of my time as I visit thrift stores, watch baseball, take naps, and sit around the yard with my family -- and you may further question my need to document everything along the way -- I think John Lennon nailed it. While I've always used the phrase "archiving the insignificant" when it comes to the various ways I litter the internet, I may have found a new motto. Have I mentioned that I hate painting? But there was no way around it. By the time I returned from dropping the kids off at VBS, she had already moved his furniture to the middle of his room and was taping the edges. A few hours later, we were done...but I still hate painting. On Monday, we were swimming across the street when my father-in-law decided to demonstrate some diving board jumps for the kids. Here's his can opener (or whatever you call it in your house). Since then, Charlotte has worked to master the can opener herself and I'd say she's on the right track. Not to be outdone, Anna has been working on her cannonball. 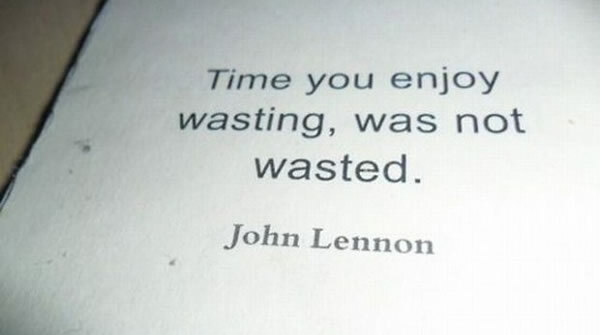 Another simple day in the books, but remember: "Time you enjoy wasting was not wasted."